Rather than going to search for a cave yourself, begin by looking for a reputable caving club. Have a look through our clubs directory, surf the Internet, or enquire at your local outdoor outfitter or mountain club they should be able to provide you with contact details. The most important reason for joining a club is that caving is a potentially dangerous sport. Many clubs offer training and introductory courses for beginners, as well as organized outings. Joining a trip led by experienced cavers will reduce the dangers and risks significantly and enable you to learn from them. Another good incentive for joining a club is that many cavers are secretive about their favourite underground venues. In an effort to protect a fragile environment, the exact location is seldom broadcast for fear that the cave may be vandalized. You are much more likely to hear of worthwhile caves if you enquire through a club who will also be able to furnish you with the latest information regarding required gear, recent closures and exciting new discoveries. 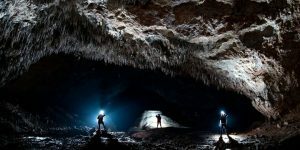 When planning a caving trip to another country, it is considered polite to contact their national caving organization. If your local club cannot provide you with the relevant contact details, search on the Internet, or contact the embassy or government representative of the country you intend to visit. You may be required to pay for permits that will allow you to cave in a foreign country. Again, check with the embassy before setting off on your trip. 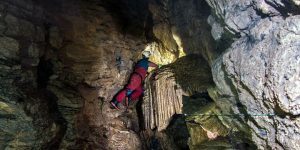 A comprehensive coverage of caving regions worldwide would merit its own website and is not within the scope of this beginner’s guide. This section presents a variety of limestone, as well as sandstone and volcanic caves. It does not provide details about the more exotic ice caves of Greenland or the salt caves of Israel. In the past, Africa was not considered a particularly cave-rich continent because few people had taken the time to look for any. The discovery of several interesting locations by overseas expeditions and an emerging local caving scene has changed this view. The major karst areas in northern Africa are situated in the mountainous regions of Morocco. The longest cave is currently Wit Tamdoun which has more than 18km (11 miles) of passages. The continents deepest, Anou Ifflis, lies further east in Algeria and reaches a depth of 1170m (3800ft). The entire region holds much potential for further exciting discoveries. Several caves were also discovered in the vast karst region of Ethiopia. The areas further west in Central Africa are not easily accessible and largely unexplored. The limestone landscapes that are found along the eastern seaboard of East Africa in countries such as Kenya and Tanzania and the island of Zanzibar have a wealth of limestone caves that have already been extensively explored. This is a volcanic region which also offers lava tubes. Mawenge Mwena reaching as deep as 305m (1000ft). The southernmost tip of the African continent is taken up by South Africa, which has major karst regions in its Mpumalanga, Northern and Northern Cape provinces. Smaller areas also occur along the Southern Cape coast. 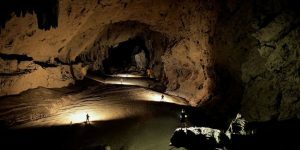 In the Cape Province, both limestone and sandstone caves can be found, among them the world famous Cango Caves complex. The island of Madagascar, lying some 412km (256 miles) east of mainland Africa, has become a very popular destination for international caving expeditions because it has large limestone areas along its western edge. Caves located in the islands northern parts, which are rather wet and tropical, have seen extensive exploration in the past, as have the drier southern regions that contain some of the deepest underground systems found on the island. The large limestone region that covers much of central Asia has huge caving potential but is yet to be explored thoroughly. One system in Uzbekistan known as the BojBulok has been surveyed to a depth of 1415m (4640ft). China is well known for its magnificent tower karst and associated river caves. Although the caves are not particularly long they contain long passages and shafts. The Miao Room in the Gebihe Cave is one of the largest cave chambers in the world. rainforests, making access to the caves difficult. Furthermore, since the dense jungle canopy effectively blocks out the sun, the caves are continually damp you need to take suitable gear with you. Gunung Mulu National Park, a popular destination on the island of Borneo, is where you will find Deer Cave. Although only a kilometre or so in length it features a gigantic chamber with an average height of over 90m (295ft) throughout. The passage, believed to be the largest in the world, is never less than 70m (230ft) wide. The cave can only be visited as part of a tour. The islands of lndonesia and Papua New Guinea are similar to Sarawak in that they, too, have large limestone regions virtually hidden beneath a lush tropical forest. Indonesia’s longest cave system has over 50km (30 miles) of passages, while the deepest cave extends deeper than 1100m (3600ft) underground. The United Kingdom is blessed with a large percentage of limestone and numerous caves. The limestone of Yorkshire, coupled with a very high rainfall, has led to a classic karst landscape. In this area you will find some famous systems such as Gaping Ghyll, Juniper Gulf and Alum Pot. To the west, in Cumbria and Lancashire, lies the massive Easegill System (70km; 43 miles long). Take heed of flood warnings when caving in this region. The show caves at Cheddar and the ever popular Swildon’s Hole (10km; 6 miles) give an indication of the caving potential existing in the Mendip Hills. Further exploration has revealed a host of other caves, including the tortuous Eastwater System (160m; 520ft deep) and the well decorated GB Cave (134m; 440ft deep). Goatchurch Cavern and other short caves in the Burrington area make ideal caving venues for beginners and are frequently used to introduce eager novices to the sport. The Forest of Dean boasts the Otter Hole near Chepstow with its many spectacular decorations, as well as the Slaughter Stream Cave which is 12km (7.5 miles) long. The large entrance to the show caves of Peak Cavern (15km; 9 miles) makes them the most famous in Derbyshire, but there are many lesser known cave systems that are also quite easy to explore. Unlike the rest of the UK, Scotland is not known for large caves, although there are some very sporting floodprone caves on the Isle of Skye. The limestone of Sutherland is the centre of Scottish caving and provides underground locations that are suitable for both beginners and the more experienced caving community. The limestone region of Southern Wales boasts Dan Yr Ogof (16km; 10miles long) near Pen y Cae with its long straw formations and large passages. Nearby, the Ogof Fynnon Ddu system has a complicated maze on an upper level and active stream passages on lower levels. Further east, Ogof Draenen with a length of 66km (41 miles) is rapidly becoming the longest cave in the United Kingdom. Mostly horizontal caves are found in Ireland’s large limestone areas. The longest cave in this country is Poulnagollum (15km; 9 miles) in County Clare, while the deepest is Reyfod Pot (179m; 585ft deep), located in County Fermanagh. One of the most important caving areas ‘down under’ is to be found in Tasmania, where dense forests cover much of the limestone, making exploration extremely difficult. Many of the caves in this region are very wet and make for some really sporting trips, provided you are adequately prepared. The best-known caving area in Australia is found in the semi-arid Nullarbor Plain. Most of the caves here are horizontal and many are partially or completely flooded. The longest one in the region is Old Homestead Cave, now over 28km (17 miles) long. Queensland Bluff, well known and much loved for its splendid tower karst, adds a different aspect to cave exploration: with internal cave temperatures continually hovering well above 30°C (86°F), wetsuits are unlikely to be a part of anyone’s gear even though the caves are wet. The isolated Kimberleys in the north-western corner of Australia have tropical karst. Most of the known caves here are horizontal and getting to them can be a challenging expedition in itself. New Zealand also has much to offer. Its deepest caves are to be found on the South Island in the regions of Mount Owen and Mount Arthur. Nettlebed Cave on Mount Arthur has a very complex system and is over 24km (15 miles) long and nearly 900m (2950ft) high. The North Island is better known for its horizontal cave systems. Of these, Waitomo Cave, with its mass of glow worms, is probably the most famous. Europe, the birthplace of caving, offers many easily accessible karst regions and some of the world s longest and deepest known caves. France and Spain share the many sinkholes and river caves occuring in the Pyrenees mountain range that straddles both countries. Some of the rivers here plunge into caves on one side of an international border and re-emerge in a different country. Although the region has been extensively explored for over 100 years, there is still much to be done. Two of the world 5 five deepest caves are located in France, among them Réseau Jean (1602m; 5250ft) and Gouffre Mirolda (1616m; 5300ft), both in the Haute-Savoie area. Spain also has its fair share of deep caves, including Torca del Cerro (1589m; 5210ft) and Sistema del Trave (1441m; 4755ft). 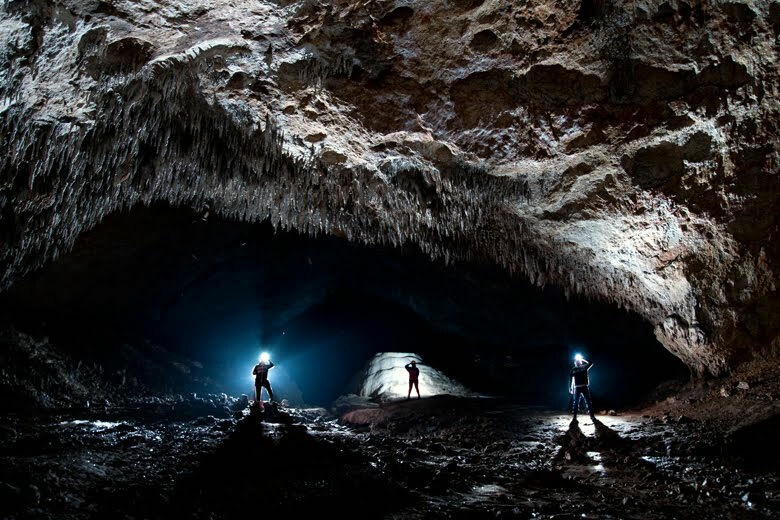 In Italy, caving has also long been a popular outdoor pursuit due to the vast number that exist there. Deep and wet cave systems can be found at both the eastern and western ends of the Italian Alps. At an impressive 1249m (4100ft), the Abisso Paolo Roversi is the deepest Italian cave, with Abisso Ulivifer at 1215m (3990ft) not far behind. Further to the south in the Apennines, there are large areas of karst still waiting to be explored. Switzerland too has many caves and a very strong caving tradition. The picturesque Oberland region in central Switzerland is a major caving area with much potential for deep cave systems that have hitherto remained undiscovered. The Siebenhengste-Hohgant system is 145km (90 miles) long and 1340m (4390ft) deep. Alpine neighbour Austria, too, has a very long caving history. It, too, is well known for its many deep systems. Austrian caves are especially famous for their wonderful ice formations that remain frozen all year round. Of the countless systems surveyed in this country, at least 11 are deeper than 1000m (3280ft), the deepest being Lamprechtshofen at 1632m (5350ft). The term karst was first used in Slovenia to describe the landscape created by a dissolving layer of rock. And indeed, this Eastern European country boasts some very impressive karst features. They include Ceki, at 1480m (4850ft) the deepest cave in Slovenia, and Postonjska Jama, which is the longest cave in this country and stretches for 19km (11.8 miles). In Portugal the Arrabida natural park has many caving opportunities for varying skill levels. For beginners you can try the The Smokes cave, which is about 300 metres long. The beginners caving is a very popular activity for stag parties in Albufeira. You can easily get to the caves by coach transfer, then be taken back either the next morning with a night partying in Lisbon, or be returned back to the Albufeira bars the same day. For Portuguese cavers with some experience there is both The Doctors Cave and the Utopia cave. 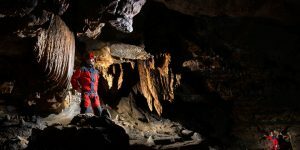 For experienced cavers there is The Capes Throat, which involves rapelling 45 metres to gain access. The Ukraine is one of the most important areas of gypsum karst in the world. This type of karst typically results in cave formations that have a maze-like network of passages. Optimisticeskaja, the second longest cave in the world, occurs here. It has an incredible 212km (131 miles) of surveyed passages. The Caucasus between the Black and Caspian seas in south-western Russia and the limestone of Georgia near the Caspian Sea are both relatively new caving areas with huge potential. Veronja Cave in Abkhazia, Georgia, recently took the title of the world’s deepest cave with a depth of 1710m (5610ft). 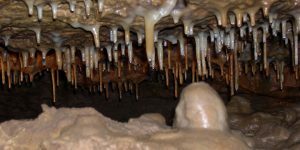 The vast North American continent is blessed with splendid areas of limestone and numerous caves, and a growing number of cavers come to explore these hidden wonders. In the northeast of the country there are many small caves in the Appalachian fold belt, while the Appalachian Plateau further west also has large areas of limestone. Since part of this extremely cave-rich area covers the states of Tennessee, Alabama and Georgia, it is known among cavers as the TAG region. This area features many deep multi-level caves. One of the most famous of these is Ellison Cave (1063m; 3490ft), which has spectacular vertical shafts. Kentucky is home to the Mammoth Cave, which has a staggering surveyed length in excess of 570km (354 miles). Widely regarded as the most famous cave in the world, exploration of Mammoth continues unabated and new cave passages with gypsum crystal formations are discovered each year. Limestone on the Ozark Plateau covers the greater part of Missouri, where caves are mostly horizontal and few are longer than 20km (12 miles) in length. Caves in the highlands of central Texas form part of interesting fossil systems that have extensive calcite decorations. Apart from the many small caves in South Dakota, two very long and complex maze-cave systems can be found in the southern United States: Wind Cave at 56km (35 miles), and Jewel Cave which is currently the seventh longest in the world with around ZOOkm (125 miles) of passages. Carlsbad Caverns National Park in the Guadalupe Mountains of New Mexico is home to two unique cave systems known as Carlsbad Caverns and Lechugilla Cave. Rising groundwater rich in sulphuric acid sculpted these caves from the surrounding limestone. This has resulted in deep, long cave systems with large passages and chambers, as well as some very unusual cave decorations. The justifiably famous Chandelier Ballroom has gypsum crystals that are over 3m (10ft) long. Irrespective of its abundance of caving regions, the deepest American cave does not occur on the mainland. Kazumura Cave, a lava tube on the Island of Hawaii holds this honour. It is over 60km (37 miles) long and 1100m (3610ft) deep. 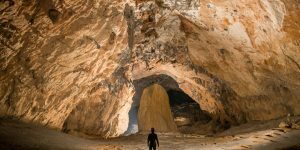 Towering mountains, plentiful limestone and a high annual rainfall are the factors that have made eastern Mexico such a premier caving destination. The Yucatan Peninsula is a large low-lying limestone plateau that is characterized by deep water-filled sinkholes. Further south lies the thick mass of the Huautla Plateau, which is permeated with deep caves. The limestone development continues further south into Guatemala and Belize. Much of Guatemala is covered in well-developed karst and there are literally hundreds of known caves here. The Chiquibul River region has many caves with large passages. The largest limestone area in South America occurs in Brazil where there are countless small caves to explore. Most of them are rather shallow with few reaching 100m (330ft). There are also limestone and volcanic caves further south in Chile. Although Venezuela also has a number of limestone caves, it is far better known for its outstanding sandstone karst. The large sandstone table mountains known locally as tepui enjoy a very high tropical rainfall. This has led to the formation of some of the deepest sandstone caves in the world, with the Aonda System reaching 382m (1250ft).